Milena Martínez was born in 1993 in Premiá de Mar, Spain. 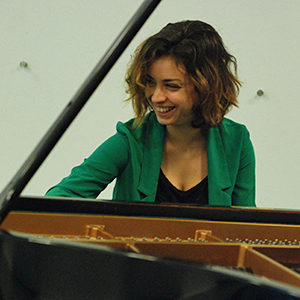 She has studied at the “Escuela de Música Reina Sofía” in Madrid with Galina Eguiazarova. She has also studied at the “Hochschule für Musik” in Basel with Tobias Schabenberger and Claudio Martínez-Mehner; and currently, she is doing a Masters Degree at the Conservatory of Amsterdam with David Kuyken, where she also plays fortepiano under the guidance of Olga Pashechenko. During all these years, she has also been influenced by Rados, Robert Levin, Stephan Kovacevich, Gordan Nikolich and Rayner Schmidt. She has performed with the “OSCYL Symphony Orchestra”, the “Sweelinck Baroque Orchestra”in The Netherlands, and with many young orchestras of Spain. She has participated in the “Mozarteum Summer Academy” in Salzburg, the “Académie de Musique” in Lausanne and the “Presjovem Festival”, among others festivals. She obtained the first prize in Lyon at the “Teresa Llacuna lnternational Competition”, the first prize by unanimous decision at the “Pedro Bote” lnternational Competition in Spain, and she has obtained also first prize at the lnternational and National Competitions “Marisa Montiel” in Jaén, “Jacinto Guerrero” in Toledo, “Río del Órbigo” in León, “Ciudad del Ejido” in Alicante and the second prize at the “Loewe-Haze lnfanta Cristina Competition”.